The Ellis team is proud to re-introduce our Ellis Team Buyer’s Advantage Program. This is a program we used many years ago when we were the first agents to put the MLS on our website. We’re bringing it back and adding some valuable features we think you’ll find useful. How would you like to be notified about upcoming listings Before they come on the market? The Ellis Team lists and sells a lot of property because our marketing works. Sande and Brett go on a lot of listing appointments each week. We don’t take them all. Some sellers aren’t ready yet, or they simply aren’t willing to price their home at today’s market value. We only bring listings that will sell to the market. We’ve created a private website for buyers in our Buyer Advantage Program™ that will post the listing appointments we’re going on. Literally you’ll find out about upcoming listings even before we list them. If one meets your criteria, you can contact us and we’ll arrange for one of our buyer specialists to show it to you. Our website is up to date so you’ll be able to search for Hot new listings in real-time. Many national websites have outdated or incorrect data which can be frustrating for a buyer. It’s terrible to find a home online only to find out it closed 2 months ago. Our website is tied into the MLS. As agents we have that privilege that national sites don’t always receive. We’re in a tight inventory market so every advantage helps. Open House Pass- Have you ever visited open houses and been hounded by agents asking you to register? Of course that agent wants to follow-up with you about the open house. They’re just doing their job. If you don’t buy the open house they want to show you others. If you find an agent that’s friendly to work with this is all fine and good. The problem comes in when you visit several open houses in a day or month. Now you have several agents contacting y ou and hounding you to shop with them. This can get quite frustrating. We’ve solved that problem. 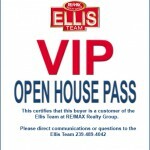 We provide you with an Open House Pass that puts other agents on notice that you’re working with the Ellis Team at RE/MAX. Now you only have to forge one relationship with a great Realtor and you won’t have pesky agents hounding you for contact information. Your life will be simpler and your agent can listen to your needs and hone in on the property you’re looking for. In a low-inventory market it pays to not waste time starting that process all over again and again. Free Reports- We’ve complied a series of buyer reports we’re getting ready to release. Members in the Buyer Advantage Program will have access to all of these reports and valuable information. Our reports cover things like how to make an offer when there are multiple offers on the property, how to best structure your offer, and what to look out for in the inspection process. Many buyers have mortgage questions as the process has changed in the past few years. We have Free reports for that. Always call the Ellis Team, we’ll handle you with care! Posted in Cape Coral, Cape Coral Real Estate, Fort Myers, Fort Myers Real Estate, Lehigh Acres, Southwest Florida Real Estate.Tagged Beat out other buyers to hot new listings, Ellis Team at RE/MAX, Ellis Team Buyer Advantage Program, Free real estate reports, Open House Pass, search MLS, SW Florida Real Estate Market Update.